The ATEN VS0404 is a 4 port Video Matrix Switch which integrates a video switch, video splitter, and a speaker together. 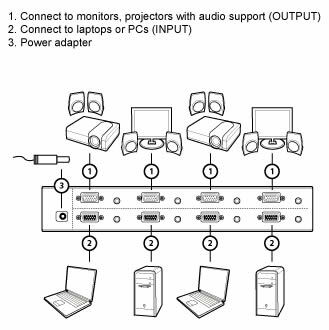 When the regular video splitter can only distribute a single video signal to multi-monitors and the regular video switch just shows a single video signal at one time, VS0404 matrix switch allows video and audio signals from 4 separate computers to be routed to 4 monitors, projectors, and speakers independently. This 4 port video switch is also a signal booster. It allows you to extend the signal transfer distance up about 210 feet with excellent video quality. To provide more outputs, VS0404 can be cascaded with regular video splitters for various applications. The VS0404 video matrix switch is ideal for presentations and applications where information from multiple computers is being delivered to multiple destinations. Supports high resolution- up to 1600 X 1200 @ 60Hz.